This week for writing we had to finish our plan for our next narrative. We had already done our character and setting descriptions done, so we knew what was going to happen in the story, and were it would take place. At the start of the term we planned our the main things the story needed to include. 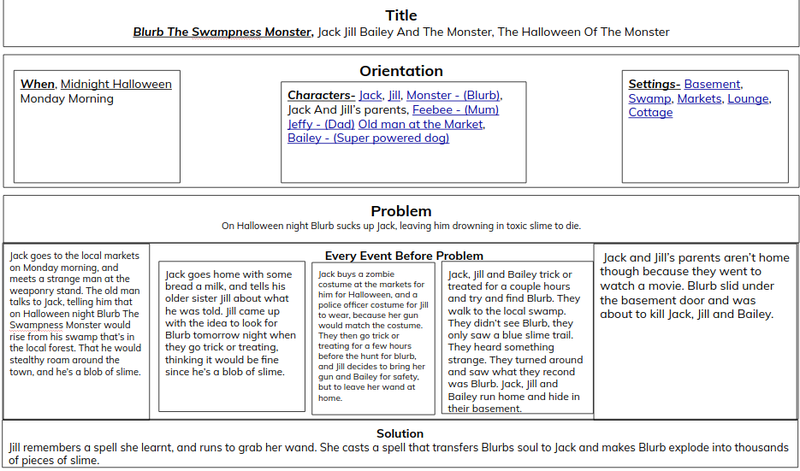 It needed to include the characters Jack, Jill and the monster, and include the settings the basement and the swamp. The problem needed to stay as Jack dies by the monster, and the solution needed to stay as Jill kills the monster, and there souls transfer, resulting in Jack being resurrected. Although we could add more characters, places, and times in the story, and also put more detail into the problem and solution. What hadn't been planned by all groups was the events, that's what we did completely individually. Kia Ora Jack, I really love the way you've put everything order.This is really Fantastic. What I really love about his that your poster is really detailed with a lot information that you are going to write out. How did the Monster find Jack and Jill? This is what I love to see from a Year 6.